Tobias Hill is a London born poet and award-winning author. Today on The Tattooed Book I’ll be reviewing a collection of short stories that won him the Pen-Macmillan Prize for Fiction, titled Skin. The first story in this collection is the title’s namesake, Skin, and is the tale that drew my attention to the collection. We meet Tomoyasu when he is twelve years old, growing up in a poor area of Japan where he’s lost his sister after she froze to death on the floor of a silkworm factory. His most prized possession is a photograph his Father has sent him of what he believes to be an American spy and from here his love for all things American grows. As an adult he sells his parents home and land, buying his Mother an apartment and moving to Kobe with the proceeds. Here he ends up working for the Company, from making bodies disappear to running a stall at the Star Festival he’ll do anything to make some money and earn their respect. After being told to ‘cover his skin’ he realises he’ll never be taken seriously until he’s tattooed and takes his savings to Horicho, a tattooist his best friend recommends. At first, he refuses but later gives in to other pressures and begins to work on Tomoyasu. Each chapter alternates between Tomoyasu and another lead character, Constable Yasuhiro Abe. Yashiro is on the hunt for a killer, a man who carried out a crime known as “washing the feet,” the murder of any Yakuza who attempts to retire. The case has been a tough one to crack especially as the remains were so hard to identify, with only partial pieces of tattooed skin left. When he’s told to move on from the case it changes from work to an obsession. After Skin, there are eight other stories, one of the best being Losing Track, the story of a young man working in a casino who falls for a woman who is part of a gambling scam. Others include Zoo, where a woman tracks down a man who has been stealing dead animals from London Zoo and The Memory Man, where a man searches for a woman with no memory. Many people steer clear of short stories, finding themselves unable to feel fully immersed in such brief glimpses of new worlds but thankfully the title story of Skin is one of the longest tales, coming in at sixty-five pages. 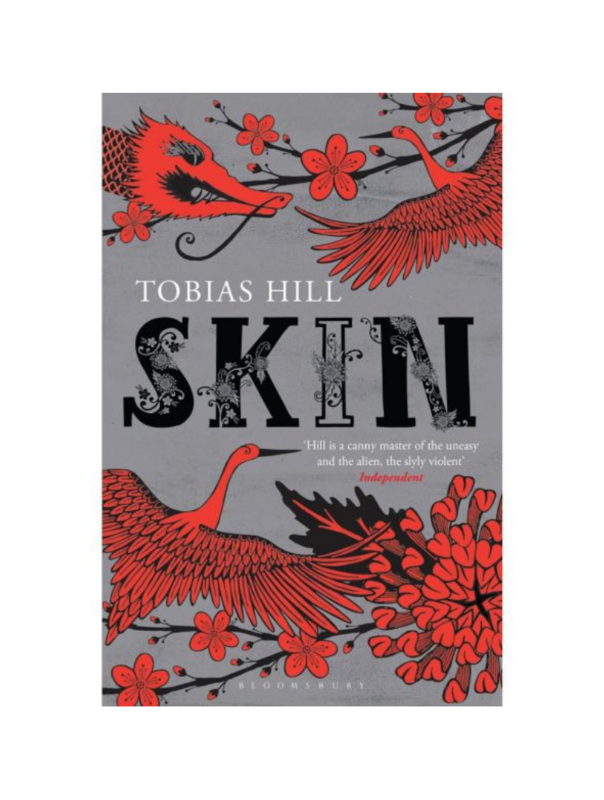 Beautifully written, with insights in Japanese culture and a great little twist at the end, Skin by Tobias Hill really is a pleasure to read and shines out as the most enjoyable piece within this collection. You warm to both the leads, Tomoyasu and Yasuhiro in equal amounts as they carry out their own battles, one to belong and the other to hunt. A couple of the shorter stories do fail to grab, with minimal character descriptions it can occasionally be difficult to differentiate between them but the longer tales are brimming with unusual plots that capture your attention as well as imagination. The idea of being an outcast and attempting to belong seems to be an ongoing theme with the main characters and the author’s life in both Japan and London influencing the stories strongly. Overall Skin by Tobias Hill is a fascinating collection that is definitely worth reading for the title story alone. If you like Skin by Tobias Hill then you’ll love Madame Zero by Sarah Hall. Read a short extract of Skin on Tobias Hills’ website.